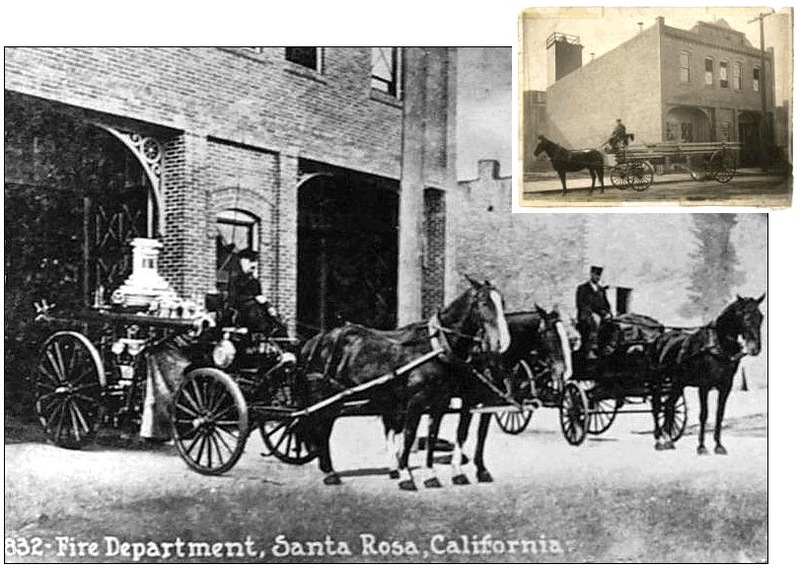 Santa Rosa took three years to replace the firehouse lost in the 1906 quake, and almost all expenses were spared. While the post office and courthouse were being fitted with marble, stained glass, mosaic flooring and other opulent features, the firemen were to make do with what could be built using the leftovers in the town’s construction fund. What they got was a rebuild of the previous brick building that collapsed after it was swept by flames following the earthquake. There were some inconsequential differences. The upstairs quarters facing the street had five windows instead of three; there was a battery room to keep the alarm box system charged and a gym for “exercises in wet weather,” both rooms probably not found in the old building. But other than that, the new firehouse appears identical to its predecessor, down to the ironwork that decorated the corners of the two bays. The Press Democrat described the new building – as well as the fire fighting equipment – in two articles transcribed below, where you’ll also find the PD repeatedly calling the firefighters “fire laddies.” That was an antiquated nickname even then, and thankfully now almost forgotten (although ye might want to keep the phrase in mind for the next “Talk Like a Pirate Day,” arggh). The new firehouse and the old firehouse – as well as the temporary shack erected after the earthquake – were all at 508 Fifth, near the intersection of B St. (Today it’s the parking lot behind Tex Wasabi’s.) But the new building didn’t have to be at that location, or be of such unimaginative Victorian-era design. The year before, respected architect John Galen Howard presented the city with plans for a state-of-the-art firehouse and adjacent City Hall that was intended to be built next to Courthouse Square. From the drawing that appeared in the newspapers, the design was in the same style as the nearby Empire Building which Howard also designed, but it wasn’t built apparently for reasons both financial and political. And sometime before that (probably 1907), esteemed architect William H. Willcox had also submitted a design, about which nothing is known. So for the next twenty years or more, the rebuilt old-fashioned building served as SRFD headquarters until a larger, modern firehouse was constructed at 415 A Street. The “laddies” weren’t long in their new digs before they faced their greatest challenge since the earthquake: Three fires within hours, the worst of them spreading fast because of high winds. Before the day was over, two factories, three hotels, a winery, several homes and nearly two square blocks had been destroyed. The fires began the morning of July 31, 1909 at the pasta factory on Sebastopol Avenue, and the building was lost by the time the Fire Department arrived. The company’s success became its ruin, as nearly three tons of macaroni was about to be shipped and the dry pasta burned well. “Santa Rosa Paste” had become a major source of pasta for San Francisco restaurants and grocers since the 1906 earthquake and fire. A few hours later, the alarm sounded for the Santa Rosa Woolen Mills on West Sixth (now the large vacant lot west of the train station). Again firefighters found a factory beyond rescue thanks to a highly flammable inventory. But this fire was in the late afternoon, when the winds in the Santa Rosa Valley pick up and shift unpredictably. The firemen were now facing a potential disaster that could burn out of control and sweep the town. The flames, seeming to mock the efforts of the fire-fighters, shot out over in the direction of the Santa Rosa Flour Mills, immediately opposite on the other side of the track. “Save the mills!” was the cry that was echoed from a thousand throats…Then the wind luckily swerved back on the hotel building and fears for the safety of the flour mills were at an end. In the meantime the fire from the woolen mills had jumped across the street and had caught the D. Cassassa property. The big frame winery, a cottage to the west, a two-story Japanese lodging house to the east, were all enveloped in flame and were burning furiously. Driven by the wind, the flames spread northward and were burning on both sides of Adams street. L. O. Battaglia’s hotel, a small two-story frame structure, and Mrs. Guidotti’s two cottages, just this side of the Toscano hotel, next caught fire. Here was where the battle royal was fought to prevent the further spread of the the flames, and keep them away from the hotel. It was as great a fight as was ever put up by a fire department in a suburban town. Within two hours, the fire was mostly contained, although nearly every building on the first block of West 6th and 7th was destroyed or suffered damage. But while that fire was still raging, word arrived that there was yet another fire underway over in the “Ludwig’s addition” section of town (today, the site of the Highway 101/12 intersection). Some of the firemen raced to that scene to find again members of the community stepping up to bat, with a bucket brigade having the flames under control. It was a day terrible and triumphant; the firefighters saved what could be saved, and no one was injured. Some of the firemen, certainly sore, smoky, and weary, stayed on watch that night to ensure that the ashes did not rekindle. Some went back to Fifth Street, where the horses were fed and watered and the equipment cleaned in preparation for the next emergency. Only then did the men crawl into their cots, having rescued the town from great disaster for the second time in three years. They must have slept soundly, there in the firehouse that Santa Rosa had built for them on the cheap. The Santa Rosa Fire Department is again housed at the fine, new building on the old site on Fifth street, the apparatus having been transferred there on Monday morning. During the day the alarm indicator was transferred and placed in position and the harness swung ready for immediate use. Later hay and feed for the horses was delivered and Monday night the men slept in the house for the first time. The new fire engine house, constructed to replace the one destroyed the morning of April 18, 1906, is one of the finest and most modern in the state. It has been arranged with the view of making it comfortable and convenient for the men. On the ground floor is the big new electric switchboard, battery room and apparatus. Up stairs the men have roomy quarters in the rear of which is the store room for hay and grain for the horses. The fire engine stands on the east side of the building with a horse on either side, while right in the rear of the engine is the hose cart with its horse’s stalls against the east side wall. The hook and ladder track stands along side of the fire engine on the west side of the building with the horse along side of the west wall. The reserve steamer stands back of the other apparatus in easy access in case of emergency. The upper floor has not yet been put in shape but as the men have the time they will fix it up to suit their taste. There will be bedrooms for those who remain on duty continually and a lounging room. Provision has been made for an exercise room as well as kitchen and dining quarters. These will be properly provided with all articles necessary so that the men can always have warm meals. Just as soon as it is ready a manual repeater will be installed so that when a telephone message is received of a fire it can be turned in from the box nearest the fire at once and thus notify the call men. [illegible microfilm] convenience as at present the department is handicapped by phone calls for its service and there is no way to notify the outside men unless the brewery whistle is also blown after a call by phone. Hook and Ladder Driver–Ed Elliott. Call Men–Harry Baker, Len Colgan, Charles Bowman, Fred Mead and A. J. Miller. Equipment–Metropolitan fire engine, 600 gallons per minute capacity; hook and ladder truck carrying hooks, ladders, picks, axes, and four ten gallon chemicals; hose cart, carrying 1,000 feet of hose, extra nozzles, etc. Reserve–La France engine, capacity 400 gallons per minute; extra hose cart with 1,000 feet of hose, and 1,400 feet extra hose. Fire alarm system with nine miles of wire, 23 boxes and automatic alarm system in the engine house. The two-story brick engine house is fully equipped for four horses and 12 men; and four fine horses weighing between 1200 and 1400 pounds each in the engine house and an extra one at the farm. The engine house is equipped with every comfort and convenience for the fire laddies. There is a fine dormitory with cots for the men, a dining room with all the necessary dishes, kitchen with furnishings for preparing a meal and baths. There is also a large and commodious gymnasium room for exercises in wet weather. In the rear of the building is a fine cemented floor machine shop for the use of the engineers so that they can do any small repair work necessary on the equipment from time to time as it is found necessary. The men are all interested in maintaining the department in a high state of efficiency and leave nothing undone to have everything in condition for emergencies. Few if any cities of much larger size can boast of a better fire fighting force than is to be found here. The old fire bell that we were wont to hear before April 18, 1906 we hear again mingling in the din ushering in 1909. It called up old memories. Thorn Gate ascended the tower and with a sledge hammer smote the big bell and gave it tongue. It sounded all right, Thorn. The Fire Fiend dealt Santa Rosa a hard blow on Saturday. Following the destruction of the Santa Rosa Paste Factory at nine o’clock in the morning, came another and far more disastrous conflagration in the evening, which wiped out the Santa Rosa Woolen Mills, D. Cassassa’s winery, the Hotel Italia Unita, a Japanese hotel, Battaglia’s hotel, and several smaller habitations, and scorched and damaged the Toscano hotel and other buildings, and for two hours caused the greatest fire-fighting and excitement the city has seen since the memorable morning of the holacost of April 18, 1906. It was exactly half past five o’clock Saturday evening when the steam siren at the Santa Rosa Cannery gave out a series of quick shrieks. These were followed a few moments later by the ringing of a general fire alarm. 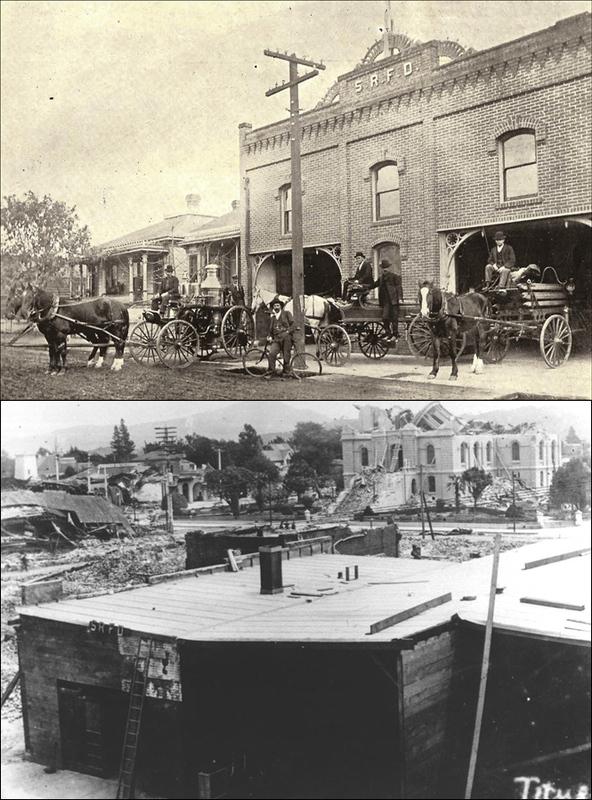 The Santa Rosa Woolen Mills, located nearly opposite the Northwestern Pacific Railroad depot, were afire. In a few seconds the entire upper story was a mass of flame. The tongues of fire, fanned by a strong wind, held angry revel, leaping here and there, sweeping the big building until it was one huge fiery furnace. In a short time it was seen that the mills were doomed to destruction. The inflammable contents were just so much flimsy fuel to add to the fierceness of the blaze. The outbuildings and storerooms went with the main structure. It was a spectacular blaze. The flames shot out through every one of the scores of windows, and soon the crumbling walls alone marked the place where the big institution half an hor previously had stood. The strong south west wind drove the huge masses of flame and fiery fragments clear across West Sixth street and Adams street. It was seen that the three-story hotel, Italia Unita, occupying the block between Adams street and the railroad, was in imminent danger. Smoke was noticed issuing from the roof. In five minutes the whole top of the structure was a mass of flames, and the wind was blowing almost a hurricane. It was readily seen that nothing could save the hotel property. The flames, seeming to mock the efforts of the fire-fighters, shot out over in the direction of the Santa Rosa Flour Mills, immediately opposite on the other side of the track. “Save the mills!” was the cry that was echoed from a thousand throats. Two streams of water were poured on the building which was then so hot that the water boiled when it drenched the corrugated iron exterior. Once in a while a bit of fire would appear which was immediately checked by the watchers. Then the wind luckily swerved back on the hotel building and fears for the safety of the flour mills were at an end. In the meantime the fire from the woolen mills had jumped across the street and had caught the D. Cassassa property. The big frame winery, a cottage to the west, a two-story Japanese lodging house to the east, were all enveloped in flame and were burning furiously. Driven by the wind, the flames spread northward and were burning on both sides of Adams street. L. O. Battaglia’s hotel, a small two-story frame structure, and Mrs. Guidotti’s two cottages, just this side of the Toscano hotel, next caught fire. Here was where the battle royal was fought to prevent the further spread of the the flames, and keep them away from the hotel. It was as great a fight as was ever put up by a fire department in a suburban town. Had the fire once caught the hotel the flames would easily have jumped across Seventh street and caught residences and the big warehouse of the Merritt Fruit Company, and goodness knows how much worse damage would have been done. As it was the Toscano hotel, owned by Mrs. Guidotti, caught on fire three times, but the flames were happily checked. Everything was removed from the three-story structure. The building was drenched with water. All this time the heat was terrific and this made it all the harder for the firemen and their scores of assistants. Men and boys worked like Trojans in the battle against the fire fiend. Fire Chief Frank Muther directed the efforts as general. Drenched to the skin, Mayor James H. Gray, Dr. J. W. Jesse, Sheriff Smith, and the Councilmen, police [and] other officals, and citizens directed the auxiliaries and fought bravely. It was no time for standing idle. Men had to work might and main and pay no heed to any who held back and criticized on the outskirts of the crowd of thousands that gathered at the fire. Directly adjoining the Hotel Unita on the railroad track was a wooden building that had been used as a bowling alley. Men tore this down and did a good job, for it helped to check the flames in that direction. It gave a better opportunity of getting at the seat of the fire. The Toscano hotel stables caught fire two or three times, and a corps of fighters led by Councilman Johnston attacked the flames successfully with sacks soaked with wine flowing from the tanks in the Cassassa cellar. For two hours the fire burned in the building mentioned. About half past seven o’clock the mastery had been gained and the danger had passed. It was midnight before the fire department left the scene. All this time water was poured on the smouldering embers, and a strict watch kept on property in the neighborhood. When the northbound Ukiah Express arrived at Santa Rosa the fire was at its height and its passage was blocked until after seven o’clock , owing to the fact that the hose was laid across the track and could not be moved. The train officials and the passengers took the delay good naturedly. They could not do otherwise. Quite a number of the passengers got in and helped fight the flames. The railroad employees got hose and kept the freight warehouse roof and sides well soaked with water. The city ambulance was in readiness at the scene of the fire, and there were a number of doctors handy. A number of the fire-fighters were overcome with the heat and smoke at times, and many of them had their clothes burned and damaged. Several people received slight burns. Fire Chief Frank Muther hurt his leg. He fell down the stairs in the woolen mills. J. L. Roberts had his leg cut while kicking out a window at the mills. While the big fire was in progress another alarm came from Ludwig’s addition, where the L. W. Carter cottage was in flames. Happily the fire was put out by a bucket brigade after a big hold had been burned in the roof. The cottage being located almost adjoining the paste factory premises destroyed by the morning fire, it is quite possible that a spark from the ruins may have caused the trouble. Ben Noonan put his auto to good use. He made several trips for coal and oil and other equipment from the engine house. James Ramage also did good work with his machine, carrying firefighters to the Ludwig’s addition fire.